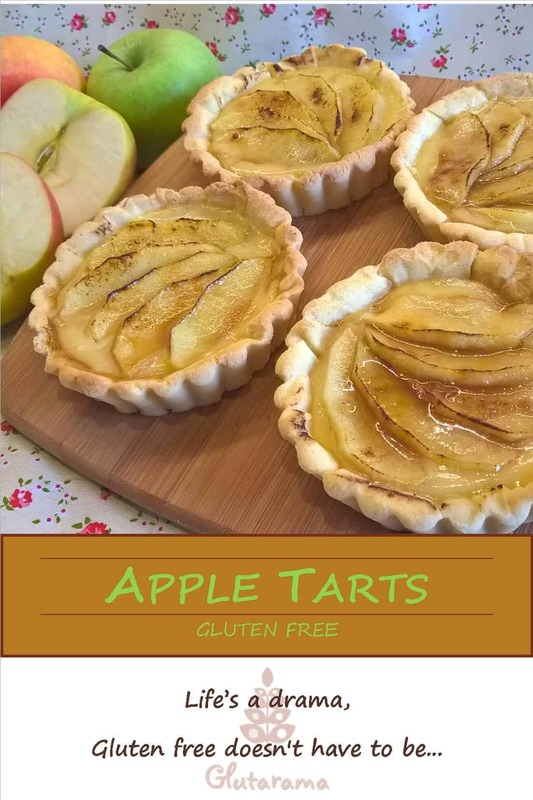 I was in an experimental mood when I made these apple tarts, I knew I had to overcome my fear of pastry because I’ve never been fantastic at it normal or gluten free. I’ve heard that if you can bake cakes, you can’t do pastry and visa versa, this is certainly true of someone I know, they make the most awesome buttery, melt-in-the-mouth pastry you will have ever tasted, their cakes, well that’s another story! As I said, I was in an experimental mood, so not only did I decide to conquer my fear of pastry, I also decided to make crème pâtissèrie which I’d never attempted before. This recipe makes enough pastry to make 8 apple tarts but I saved half for another idea I had in the pipeline, it can easily be frozen or chilled until you wish to use. Stir in the sugar so it looks like a crumble mix then add the egg. Using a rounded knife stir the egg into the crumb mixture until it begins to come together. Turn out onto a well floured surface and knead quickly into a ball. Wrap the dough in cling film and pop in the fridge whilst you make the crème pâtissèrie. To make the crème pâtissèrie put the egg, sugar, vanilla and flour into a bowl, take a little of the milk and mix the dry ingredients to a paste. Pour the remaining milk into a saucepan and bring to a gentle boil. Pour onto the paste mixture whisking quickly to prevent lumps. The crème pâtissèrie is ready when it resembles a thick custard. Pour into a bowl and press down a piece of cling film to prevent a skin forming. Allow to cool whilst blind baking tart cases. Roll out the chilled pastry and cut 4 rounds large enough to fit 4 fluted tartlet tins - I use loose bottomed tins. Using 4 squares of foil, cover each tart and fill the foil shells with baking beans or rice if you have no beans. Bake in oven at 200C/400F/Gas 6 for 10 minutes, then remove the foil shells and beans and dry for a further 5-10 minutes. Allow pastry tart shells to cool completely, then pour in the crème pâtissèrie into each shell, pop in the fridge to chill whilst making the apple decoration. In a frying pan add the apple slices, sugar and butter and heat gently so that the sugar and butter melts and coats the apple, to gain an extra brown caramelised look you can pop under the grill for a couple of minutes or use a chefs blow torch if you have one. Remove apple and place on a sheet of baking paper to cool. Once cool top the tartlets with the apple in a pattern of your choice. PreviousMini Christmas Cake Delicious and Gluten Free!